– In his “important speech”, the president asked educators to instill patriotism in young people and reject “misconceptions and ideologies”. Since 2012, a struggle against the spread of “Western values” and the ban on religious education for young people is underway in schools and universities. AsiaNews (21.03.2019) – “Nourishing” faith in the Chinese Communist Party and rejecting “misconceptions and ideologies”: this is the program that Chinese president Xi Jinping proposed to a group of teachers gathered yesterday in the capital for a seminar on “ideological theory” and politics “. According to Xinhua, Xi gave an “important speech”. In it, the party leader, who is also general secretary and head of the military commission, said that starting with toddlers China must “nurture generation after generation [of young people] who support Chinese Communist Party rule and China’s socialist system”. He also asked all educators to instill patriotism in young people and reject “misconceptions and ideologies”. Since Xi took power in 2012, the Party has launched a battle against the spread of “Western values” in schools and universities, banning books that promote “Western ideas” such as democracy and the rule of law. At the same time, those who spread “religious” ideas among students are prosecuted. In the name of “patriotism” students are required to reject religions, especially those that come “from the West”, that is Christianity, making students swear to fight them. The new regulations on religious activities prohibit young people under 18 from going to church or receiving a religious education. – HRWF (23.02.2019) – Saudi Arabia and China have just signed commercial agreements for $ 28 billion (See the article of The New York Times on 20 February: https://nyti.ms/2BLEqsG). Annoyed by human rights criticisms and anti-corruption investigations in North America and the EU, Saudi Arabia is suddenly increasing and accelerating his business relations with China. 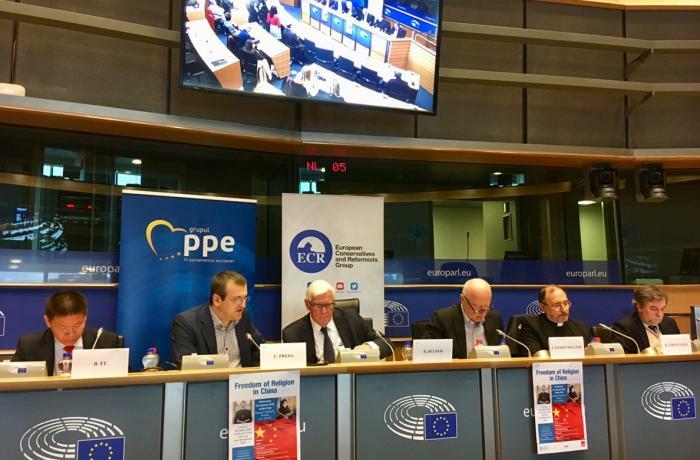 One of the priority human rights issues which will be scrutinized by NGOs will be the situation of one million Muslims of all ages belonging to the Uyghur ethnicity. Perceiving them as a threat to national security, Beijing has deprived them of their freedom and put them in camps to allegedly “de-radicalize” them. Saudi Arabia’s crown prince has already taken sides with China’s President Xi Jinping on this problem, omitting to say that his country is highly responsible for the “radicalization” of Muslims in the world. Time for Muslim majority countries to unite their diplomatic and other efforts for the release of all the Uyghur Muslims in China. “Activists say MBS’ support for China’s ‘anti-terrorism’ measures is tacit approval of crackdown on Uighur Muslims. Saudi Crown Prince Mohammed bin Salman (MBS) has supported China’s right to undertake “anti-terrorism” and “de-extremism” measures, according to Chinese state media, in remarks activists lambasted as a defence of Beijing’s crackdown on its Uighur Muslim minority. Prince Mohammed made the comments to Chinese President Xi Jinping on Friday during a visit to Beijing, the last leg of an Asian tour that included Pakistan and India, according to state-run news outlets. In his talks with Xi, MBS hailed relations with China as trouble free, the official Xinhua news agency reported, while Xi urged joint efforts to counter extremism and terror. “China has the right to take anti-terrorism and de-extremism measures to safeguard national security,” MBS told Xi, according to the state-owned CCTV. “Saudi Arabia respects and supports it and is willing to strengthen cooperation with China,” he added. Riyadh has remained silent over China’s treatment of Uighurs and other mostly Muslim minorities in the far-western region of Xinjiang. That’s despite the ruling Al Saud family’s image of itself as the defender of Muslims across the world and protector of Islam’s two holiest shrines. Activists slammed MBS’ stand, with Miqdaad Versi, spokesperson for Britain’s Muslim Council, calling the remarks “disgusting” and a defence of “the use of concentration camps against Uighur Muslims”. The World Uyghur Congress, a Germany-based advocacy group, said MBS’s failure to raise the issue of the Uighur detentions amounted to tacit support for “China’s gross rights violations”. The Saudi crown prince’s visit came five months after the crown prince came under intense pressure in the US and elsewhere following the killing of journalist Jamal Khashoggi at the Saudi consulate in Istanbul. In the US Congress, criticism has also been building for months over the kingdom’s handling of the war in Yemen, where it is accused of causing widespread casualties and suffering among civilians. China has refrained from faulting Saudi Arabia over issues such as the war or killing of the journalist, in keeping with its long-held tradition of non-interference in other countries’ affairs. The hush-hush approach reflects how China and Saudi Arabia have grown close over the past decade based on complementary economic interests, said Michael Clarke of Australian National University’s National Security College. “Basically, in the Saudi case there seem to be very clear incentives for it to not rock the boat in service of the Uighur issue,” Clarke told The Associated Press news agency. During MBS’ visit to China, Riyadh’s national oil giant Saudi Aramco said it had signed an agreement to form a Saudi-Chinese joint venture, worth more than $10bn, to develop a refining and petrochemical complex in northeastern Liaoning province. The Saudi Arabian General Investment Authority also announced the signing of 35 non-binding memorandums of understanding, worth $28bn, including deals related to energy, mining, transportation and e-commerce. Bitter Winter (26.01.2019) – https://bit.ly/2Tt43W0– The children of the detained Uyghur parents are kept in so-called Loving Heart kindergartens and schools in Xinjiang. They undergo full-time supervision and receive their education in Chinese only. Usually, the iron gates of these Loving Heart facilities are firmly locked. The walls are surrounded by barbed wire, and access is strictly controlled. There is little chance for these children to go outside. The children only get to see their parents once a month during a monthly video call. According to a teacher of one kindergarten, the children always cry after talking with their parents on video. – Bitter Winter (27.12/2018) – https://bit.ly/2BI559d – Accused of espionage and subversion, at least 45 contributors are in custody; the reporter who filmed a secret camp in Xinjiang “disappeared” after the arrest. In August 2018, the Chinese Communist Party (CCP) authorities designated Bitter Winter a “foreign hostile website” for publishing secret documents and news reports about the CCP’s suppression of religious beliefs and Universal Declaration of Human Rights of 1948.” The authorities have retaliated by launching repeated attempts to hack the website, and by targeting reporters and contributors. Since August, at least 45 Bitter Winter contributors in mainland China have been arrested for filming incidents of, or gathering news about, the CCP’s persecution of religious freedom and violation of human rights. Reporters are usually detained and interrogated on the charge of “divulging state secrets” or “involvement in infiltration by foreign forces.” Some reporters have been sent to legal education centers” to undergo mandatory indoctrination, while others have been tortured and abused. Another contributor, from Xinjiang, conducted groundbreaking investigative reporting into transformation through education camps,” including their internal construction. That contributor was arrested at the end of September. To date, his whereabouts remain unknown.